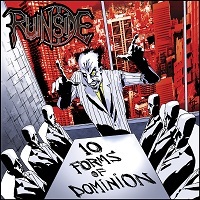 “Lay down, I will take care of you.” Words of a silver tongue that hide an evil intention from the intro “The Fall” by RUINSIDE from the bands sophomore album “10 Forms of Dominion”. Finnish metalers bring forth an 11 song onslaught of sonic force packed with a laundry list of catchy hooks and battalions of guitar layers that will tunnel in your ear hole and lay a thick slimy stack of eggs. “The Sickness” kicks into high gear after the acoustic guitar and spoken word intro concludes. Heavy guitar tones are well produced and the mix is even and full. It’s difficult to shake the radio rock vibe within the mix but RUINSIDE does well to maintain the cheese factor and comes through with a truly heavy, head banging, fist pumping metal album. “Dethroned to Be Thriven” provides the next pounding chorus melody and sing along. Reading the song title before hearing the song resulted in a “WTF? !” moment, however these very words are easily repeated along with a walking guitar melody that drives your foot into the ground and your fist into the air. “Corridors of Power” next plunges a grappling hook into your eardrum and shoots lightning through your veins. At this point in the album it must be noted that the vocals are a weary beast upon itself. Toni Salminen croons with a unique and aggressive timbre. There is certainly a vocal structure template established early of a spoken word first half verse followed by a more aggressive retort into a gang vocal chorus. Good stuff, but nothing that is breaking the mold of heavy metal ingenuity. I found the reliability for strong chorus melodies and head banging riffing very rewarding but not played out. “Dancing to The Demon's Tune” displays RUINSIDE’s diversity in tempo with a slower chugging dogma. Along with “The Beginning of Nothingness” the midsection of “10 forms of Dominion” loses a touch of luster with little variety of riffing and vocals falling in line with early structuring trends. Still the wording and imagery are appealing to the ear and the heaviness of the guitars never gets old. The gang vocal choruses are reminiscent of ACCEPT in structure which is not a bad thing at all. The second half of “10 Forms of Dominion” provides much more of the metal goodness with chorus crafting in “Juggernaut” that has one of the more interesting vocal entries within this album. There are a multitude of strong, memorable hooks within the 11 song madhouse that will keep the listener coming back for more and humming odd look-drawing melodies down the hallway. “10 Forms of Dominion” is an excellent second release for the Finnish metal merchants paving the way for a bright future in the dark sun.